Our website address is: http://dark-age-productions.com. 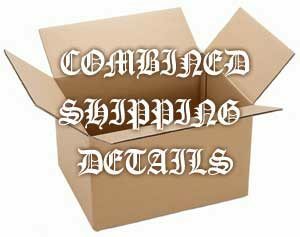 In order to process and ship your order we must collect your name, mailing address and contact email. A telephone number is requested by the checkout software but entering a phone number is not required and no one from Dark Age Productions will ever call you. If we need to contact you regarding your order we will be in touch via email. At no point in your transaction is Dark Age Productions in possession of your personal payment details – we receive only a completed payment confirmation from PayPal alerting us of your order. Dark Age Productions does not accept any forms of payment other than PayPal (e.g. money orders, cash, wire transfers or personal checks). Our parent company Metal Hell Records is a verified PayPal account and therefore users do not need a PayPal account in order to shop our site and checkout using the secure PayPal payment checkout portal. We may on occasion (no more than once per month) send out an email newsletter with the latest news and updates about Dark Age Productions and Metal Hell Records releases. There is always an unsubscribe link at the bottom of the newsletter so if you no longer wish to receive them you may simply click the “unsubscribe” button and you will be automatically removed from the subscribers list. Our contact form sends your message to our main business email address but it does not store your messages on the website itself. Dark Age Productions does not place tracking cookies or pixels on our pages. Cookies may be used by the shopping cart software in order to display your shopping cart items over multiple pages as your browse the site before you checkout. These should expire automatically when you log out of your internet browser or clear your browsers cookies & history, depending on how your browser is setup. Articles on this site may include embedded content (e.g. videos, streaming audio, etc.). Embedded content from other websites behaves in the same way as if you have visited the other website. Dark Age Productions does not have any site analytics or pixels embedded in our site. Dark Age Productions does not share customer data with anyone outside our organization. Dark Age Productions does not retain any user data (name, shipping address & contact email) beyond processing your order. Customer details are deleted from our site once the order has been fulfilled. We may on occasion (no more than once per month but often less than that) send out a newsletter with the latest news and updates about Dark Age Productions and Metal Hell Records releases. There is always an unsubscribe link at the bottom of the newsletter so if you no longer wish to receive them you may simply click the “unsubscribe” button and you will be automatically removed from the subscribers list.